That seems to be the deal with Trump supporters. Otherwise, how do you explain photos like this one? They guy on the right, by the way, is wearing an RNC pin on his MAGA hat. So in case you think they're fringe lunatics, think again. They may well be mainstream lunatics in 2018 America. Trump himself is in rare form, which is to say, exactly the same form as always. He appears to be throwing his son under the bus, while, as usual, denying any culpability on his part. So politicians routinely get together with foreign powers and try to figure out how to sink their opponents. That's a new one on me. This comes from a guy who stands in front of rallies and demands that voters use photo IDs, despite no evidence of voter fraud. In any case, it's evidently fine that the Russians influence our elections, as long as they do so on Trump's side. 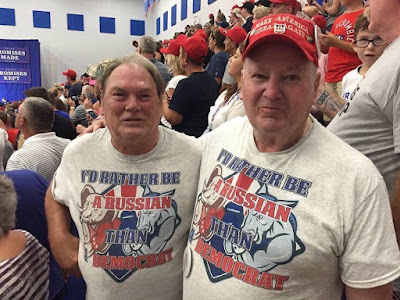 And it's looking like there's a market for those shirts, so it's not a big jump to see that diehard Trump supporters don't care about that in the least. And after a newsroom was shot up, Trump is still trashing the free press. Though he's a chronic and serial liar, his supporters seem good with believing him. After all, making racism great again hasn't been easy to achieve. I'm at a loss for words that, in 2018, people muster the audacity to broadcast messages like that. Make no mistake, it's Trump telling these people that's okay. There's a message when he calls Maxine Waters and Don Lemon and Lebron James dumb, and low IQ, and whatever juvenile ramblings happen to cross his feeble mind. It's embarrassing to have Donald Trump as our ostensible leader. I would not tolerate his behavior or language in my classroom. When I compared his tweets to something you'd hear in a junior high rank out session, a junior high school teacher on Facebook took umbrage, and said his junior high school students are more mature than that. I apologized to him. There's hope, personified by Alexandria Ocasio Cortez, Zephyr Teachout, and others who stand for decency and fairness. But it's a long road for us. Millions of Americans are willing to vote against their economic interests, against the future of their children, and against the future of their country simply to have a high-ranking voice of authority tell them their racism and hatred are socially acceptable. It's on us to change that. Our next chance comes in four short months. Don't forget to vote.